Editor’s Note: In honor of Pediatric Safety’s 4 year bloggiversary, we are publishing 4 of our favorite posts from the past, one each Friday for four consecutive weeks. This – our 4th and final post – was originally published in April 2011 by Rebecca Wear Robinson, a member of our PedSafe Expert Team. Rebecca has dedicated her life to keeping kids safe around water and it is both an honor and a privilege to work with her. 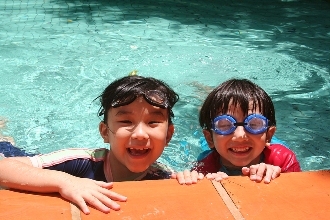 When should you allow your child to go to a pool or beach without adult supervision? How old is ‘old enough’? Stefanie (from PediatricSafety.net) alerted me to an interesting article last week that prompted the question – a 14-year old girl saved her 10-year old brother from drowning while the two played at a hotel pool, unsupervised. No charges were filed against the parent because 10 was deemed ‘old enough’ by the local police to be in the pool without adult supervision. But there was no mention of either child’s swimming abilities. Could the 10-year old swim? Could he truly swim or just paddle a bit? How responsible was the younger brother? Was he a dare-devil or a cautious kid? How deep was the water? Was he tired or jet-lagged? Did he have any physical, emotional or mental issues that would have impaired his abilities or judgment? There are plenty of guidelines that tell us what age and weight our child has to be to change car seats. Laws dictate when our child can drive, drink and vote. But water safety is the great unknown – so many variables that are hard to measure. So how do parents determine if a child is ‘old enough’ to be unsupervised at a pool or beach? Broward County in Florida is on the cutting edge of water safety and they recommend a minimum age of 12, though some experts believe it should be even higher. Until national standards are developed, as a parent I’d set 12 as the minimum age (though I’m feeling better with 15), but I’d also look closely at all the other variables. Is your child a truly competent swimmer? (ask their swim teacher, don’t rely on your judgement or your child’s) Who else will be in the pool? Are they competent swimmers or could your child get in trouble with a panic-stricken friend who could pull someone under? How many children? More children = more adrenaline = more potential trouble. Is it a pool or open water? If it’s open water does your child have experience in that particular kind of open water? A river is different from a lake which is different from an ocean. As parents, if we do our job right our child grow up to self-regulate their behavior and make responsible decisions, but it’s also our job to keep them safe until those skills are in place. Besides, volunteering for pool patrol is a pretty nice way to spend the summer! My kids (boy & girl now 23 & 21) had to be 11 years old to go into OUR pool without an adult. But age was just a starting point, their swimming ability and maturity level was also very important. And when they went into a pool with strangers there had to be an adult swimmer near by. Excellent ‘rules of thumb’ Gunnerds!